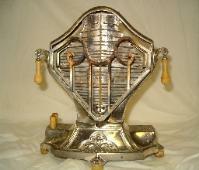 Need a cost estimate on the restoration of an antique lamp or the repair of a coffee maker? We will provide one. Call or email us today! We will assess the cost of any appliance repair, restoration or rewiring needs. We repair small household and business appliances, as well as a variety of other small motorized products, such as ceiling fans, scooters and Power Wheels toys. We restore vintage appliances, such as mixers, toasters and fans, among many other products. As part of the restoration, we will clean and rewire to "restore" the product to it's original gleeming and optimal working condition. Sometimes a lamp just needs a new cord or a mixer needs the wiring tweeked. We will assess the product's needs, and rewire as needed. Tinkering with appliances is what we do. Over the years, we have repaired and restored appliances that we have purched or have been donated or abandoned. Do you need a fan or an old salon hair dryer for your museum? Call us and we may have just the right accessory for your needs! In order to repair, restore and rewire, we keep a wide selection of parts on hand to ensure that our final products are in top working order. We also have a variety of older parts and repair catalogues. For additional details, contact us!